The YOGA Mouse is your ultimate travel mouse for both work & play. It features a slim and elegant design without compromising comfort and grip. A rechargeable battery is integrated and sealed inside eliminating the need to buy spares. For connectivity, the mouse supports either Bluetooth 4.0 or 2.4 GHz wireless connection to give maximum flexibility. 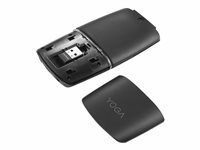 The YOGA Mouse boasts an adaptive touch display when in flat mode that provides additional control for presentation and entertainment.